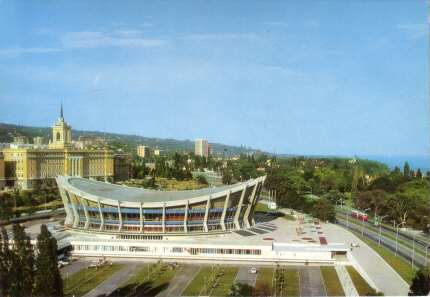 "Palace of Sport and Culture", built 1966-1968. 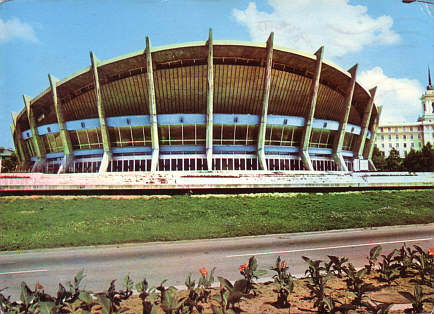 The companies working on the Varna Palace were also responsible for the National Theatre in Lagos, Nigeria, which resembles the building in Varna. Front Text: "Varna - Dvorets na sporta i kulturata, Varna - Dvorets sporta i kultury, Warna - Der Palast für Sport und Kultur"
Front Text: "Varna - Dvorets na sporta i kulturata, Varna - Dvorets sporta i kultury, Varna - Le Palais du sport et de la culture, Varna - Sport und Kulturpalast"